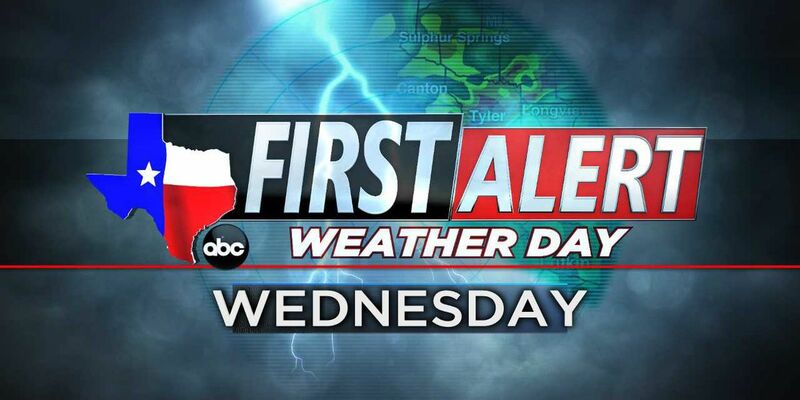 EAST TEXAS (KLTV) - A First Alert Weather Day has been issued for Wednesday, April 17th as another round of strong to severe storms will be likely, especially in the afternoon-evening hours for our area. Currently, strong southerly flow has returned to East Texas. As we advance through the next few days, these southerly winds will continue to push warm, moist air into our area. As we head into Wednesday, a strong upper-level disturbance will track into East Texas. At the same time, another surface low will develop near southwest Oklahoma, increasing the southerly flow of unstable gulf air and deepening our moisture content in the lower levels of the atmosphere. We will see a weak cap in place(inhibition of storms developing due to dry air overhead) but a cold front and dry line will start to push through on Wednesday afternoon, giving the storms the forcing they need at the surface to begin firing off. This has the potential of carrying over into an overnight event. We all need to be very weather aware as we get closer to Wednesday. Now is the time to make sure you have your severe weather plans. Know where to go in your home if you are included in a Tornado Warning and make sure you have a way of receiving those very important weather warnings, either by cell phone or weather radio. Timing is tricky, but it looks like this will be a later afternoon/evening event for East Texas. We will likely see a strong north-south oriented line of storms develop, which will then track to the east. As always with these storm systems, a few strong supercells could develop ahead of the cold front as well and will need to be monitored for closely. Once the front passes through, East Texas will begin to dry out and stay dry through the weekend. Timelines will be vague until we get closer to Wednesday, where we can give you an accurate idea of when these storms will impact where you live. Be sure to continue to check in and stay weather aware for updates. All forms of severe threats exist on Wednesday, with the primary threats being large hail up to the size of golf balls and damaging severe thunderstorm winds. We could see upwards of 1.00″-2.00″ of additional rainfall so flash flooding in low lying areas remains a possibility as well. Isolated tornadoes cannot be ruled out. Remember: it doesn’t have to be a tornado to cause damage to yourself or your property. These threats are rated as severe for a reason!! Always stay away from windows during a severe threat.